How was your weekend? Did you do anything fun, anything exciting happened? Do tell. Mine was the usual errands, cleaning, and happened to sneak in a girls night out plus gave my hair quick refresher with Schwarzkopf Color Ultime™ Ibotta Offer ($2 cash back) to keep my mane intense color vibrancy. I enjoy using Schwarzkopf brand because it colors hair evenly, even on porous hair. It is especially developed for brilliant color results that are vibrant and defy grays. I do not get to spend lot of quality time with my girlfriends, so when I do get a chance, I almost always dress up. I'm usually adamant that we go somewhere fancy so that my reason for dressing up is validated. Ha! Do any of you do that? Whenever I am getting dress I encourage a particular routine and I'm going to share that with you in steps. Step One:Where am I going, what is the dress code and what time of day.? I also think about the decor of the place (I look it up online if it's my first time) and tie that in with my outfit. Step Two: Go through my closet and pick three choices and work down from there. Step Three: I try them on, decide which one looks good at that time or which one suits the location, my comfort level and need for my time out. Clearly I went with option two for girls night out. it was fun and loose and offered space for drinks, desert, and lots of food. I also tend closely to my jewelry choices and select pieces that wont outdo my dress. After all, it is girls night out, and not a fashion show. I absolutely love the renewed color and tone of my hair after using Schwarzkopf and that makes me more confident to flip my hair with my girls over good conversations. Nothing beats confidence and happiness. 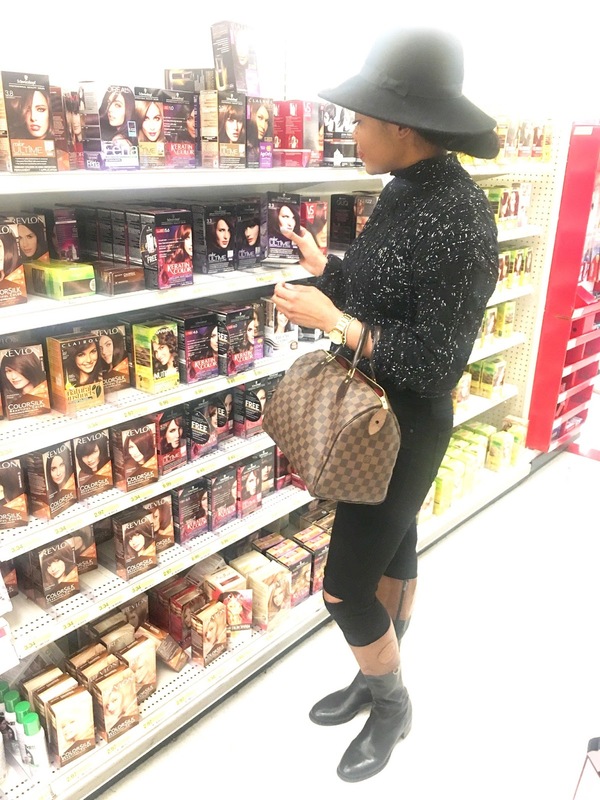 You can find Schwarzkopf Hair Color Ultime at your local Target in the Hair Care/Hair Color aisle. It's super easy to find. I do hope you enjoyed this post. Let me know if you have tried Schwarzkopf Hair Color before and how you like it, or if you plan on trying it out. Also, what do you do when you get together with your girlfriends, share your get ready tips below. Enjoy the rest of your week loves. Your hair looks amazing!! That's the perfect shade for you! Also, love that yellow dress! My weekend consisted of studying for my 6 finals, Im done Friday so I'm super looking forward to it! Great post, love your ideas and getting ready outfits! Loving all the outfits, but especially the yellow dress! Such a truly gorgeous post! I love this beautiful yellow on you and your hair is stunning!!! You are such a hottie! Love that yellow dress, it was definitely the right choice! Your hair looks amazing! Can you believe I've never colored my hair before? What a wonderful post! Your hair looks amazing!!! Hello my friend. That yellow dress looks beautiful on you. I'm getting some Belle from Beauty and the Beast vibes :). And your hair looks so amazing girl! I hope you had a great night out slaying the town. Your hair looks so shiny and gorgeous! I need to dye my hair again. Definitely going to be trying Schwartzkofp. It seems like it works really well!! Thanks for sharing!